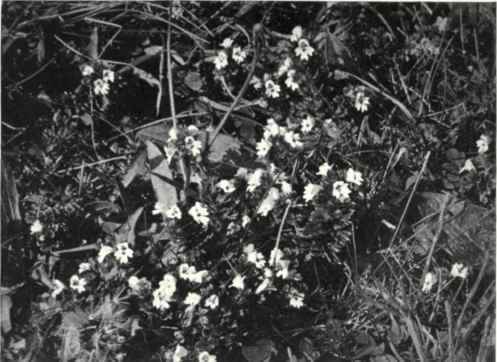 There are no traces of Eyebright, which is a northern type, in any ancient deposits. It is found in the Arctic and N. Temperate Zones in Arctic Europe, N. and W. Asia, the Himalayas, and N. America. As an aggregate the old E. officinalis occurs in every county except Cardigan, Stirling, Main Argyle, but the segregate is found in only 47 vice-counties. It ranges as far north as the Shetlands, and in the Highlands up to 3600 ft. It is native in Ireland and the Channel Islands. Eyebright is an upland species as a rule, and is found in meadows, as well as frequent on heaths, moors, and commons. It is a xero-phyte. Associated with it are Milkwort, Grassy Stitchwort, Furze, Broom, Tormentil, Heath Bedstraw, Harebell, Red Rattle, and many other ericetal and pratal species. The stem is large, robust, without any glands, branched, with deeply coarsely-toothed and folded leaves, spreading, egg-shaped to lance-shaped, acute, with curved teeth, the bracts spreading, curved back, with broad and short and acute teeth. The flowers are white, with a blue upper lip, and yellow on the lower lip, borne on a long spike, terminal, with triangular sepals. The corolla is small. The fruit is inversely egg-shaped, notched at the end, fringed with hairs, and longer than the calyx. This plant may be 1 ft. high, but is usually about 6 in. It flowers in July up till September. The plant is annual, propagated by seeds. It is a hemi-parasite on the roots of grasses, penetrating by nodular suckers into the host. Possibly some nutriment is returned to the latter on the death of the Eyebright. The honey is secreted by the lower part of the ovary, which is smooth and swollen in front, concealing the honey, and hairy above, and so protecting it. The corolla tube is 4-6 mm., and enlarged below. Short-lipped insects can get at the honey by thrusting their heads into the wider part. The upper lip is a vaulted roof which shelters the honey and pollen from the rain, and an insect's proboscis cannot be thrust in above the 4 stamens (with 8 anthers). The lower lip is 3-lobed, and small insects alight on it, while larger ones place their forelegs on it. There is an orange spot or honey-guide on the inner lip and at the entrance, and the violet lines converging to the centre also serve the same purpose. The lengthening of the corolla brings the stigma and anthers closer. The anthers are behind at first in some flowers. The anthers meet together, the 2 lower chambers of each upper or outer pair uniting with the upper of the inner or lower stamens on the same side. The lower surface of the anther is produced into a sharp point, which the bee touches with its proboscis as it passes down the tube, and it serves as a lever, shaking the pollen from the anthers upon the insect. It is visited by Honey-bees, Bombus, Nomada; Diptera, Systoechus, Syrphus, Melithreptus. This large-flowered form is proterandrous and cross-pollinated. There are forms in which the stigma matures first. The smaller-flowered plants are self-pollinated. The lower chambers of the upper anthers, which are outer, unite firmly with the inner and lower anthers. There is a stiff-pointed process on the lower surface. The lower points exceed the upper, projecting into the mouth, the upper terminating in a brush of hairs, and these prevent the pollen from being scattered at the side. A bee touching them disperses the hairs, and pollen falls upon the insect. The capsule opens above, and the seeds are dispersed around the parent plant. Eyebright is a humus-loving plant, a heath plant, parasitic on grasses, and requires a humus soil. The leaves are attacked by the fungus Plasmopora densa and Coleosporium euphrasioe. A moth, the Pretty Pinion (Emmelesia blandiata), feeds upon it. Euphrasia, Fuchs, is Greek for gladness. It was formerly called Euphrosyne from its reputed cure for eyes. The second Latin name indicates the woodland habitat. It grows on grassy slopes. Eyebright is also called Adhib, Euphrasy, Ewfras. Coles says: "Divers authors write that goldfinches, linnets, and some other birds, make use of this herb for the repairing of their own and their young ones' sight. . . . The purple and yellow spots and stripes, which are upon the flowers of Eyebright, doth very much resemble the diseases of the eyes as bloodshot, by which signature it hath been found that this herb is very affectual for the curing of the same." It was supposed (and is now) to be good for the eye, owing to the black pupil-like spot in its corolla, by Doctrine of Signatures. "If she, whom I implore Urania, deign, With Euphrasy, to purge away the mists Which humid dim the mirror of the mind". In Chaucer's day it was held a cure for all eye diseases, and described as "Precious water to clear a man's sight and destroy the pin" (a sty). Essential Specific Characters: 238. Euphrasia nemorosa, H. Mart. - Stem branched, without glands, no leaves ovate-lanceolate, dentate, upper with recurved teeth, flowers white or blue with yellow spots, small, fruit obovate, exceeding the calyx teeth.